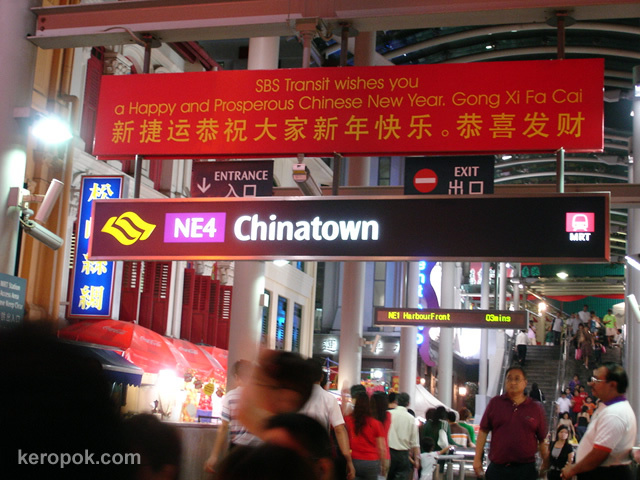 Which is the best way to get to Chinatown? Take the SBS Transit trains. When we were there, we drove, and you go to wait very long to get a parking space. Take the trains and alight at NE4. NE stands for the North-East line. Nice photo. I like the busy scene. How much is a ride on the MRT? So easy to get to Chinatown now with MRT, my recollection was many years endless constructions, so where's the adventure of traveling there now? Is it a train or a metro station? ming, the most expensive or furthest train rides will cost $1.90 if using cash. it will be less using a prepaid card. isabella, its a MRT, Mass Rapit Transit. which is more like a metro than a train. singapore's very small :-) There's a train, but that goes to the next country. tres belle photo, les couleurs sont tres belles. very beautiful photograph, the colors are very beautiful.